Albania is a micro power in Southern Europe. Historically, it was attacked and militarily occupied by Italy from 1939-1943. It is led by King Zog I. It only exists in the 1936 start. Albania is in the lower Balkans Region, which is part of Southern Europe. It is made up of one state, Albania. They have a land border with Yugoslavia and Greece. They are not landlocked, with a large border on the Adriatic Sea. Its most important area is the border with Greece, which is used as an attack point for Italy when invading Greece. Albania is mostly (over 70%) made up of rugged mountains and hills all over. The coasts have small plains and beaches. There are small lagoons and wetlands as well. It will end up annexed by Italy (or another player-controlled country) unless controlled by a player. 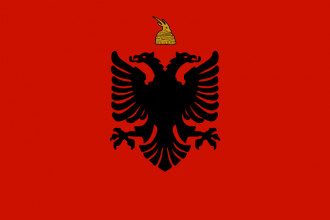 Albania was a new nation formed after the end of the First World War. It was previously part of the Ottoman Empire. It's most notable leader was Ahmet Muhtar Zogolli, better known as King Zog. His title was, at first, Prime Minister, then President, and finally King. He ruled for 17 years. The Italian invasion and subsequent annexation of Albania ended his rule. Albania and Ethiopia would end up being the only countries Italy would manage to defeat by itself. Albania only had an army equipped with obsolete weapons and a tiny navy that was composed of 2 old German gunboats and 4 Italian torpedo boats. It's quick defeat was no surprise, yet the Italians had some trouble with such a small army. When the Italians surrendered in 1943, the Germans took over control of Albania for a brief period, it's status similar to Slovakia, a client state of Nazi Germany. Albania, lacking a unique national focus tree, uses the generic national focus tree instead. Albania is a mostly isolated country, with all diplomacy values revolving around "Different Ideology", "Same Ideology" and "Same Ruling Party". The only exception is Italy, which starts with a -25 opinion because Italy claims Albanian provinces. They have a land border with Greece and Yugoslavia. They have a coast and therefore are not land-locked. Albania does not have any alliances to begin with. It is guaranteed by Italy. King Zog of the non-aligned House of Zogu leads completely unopposed in the 1936 scenario, holding 100% popularity. Albania no longer exists in the 1939 scenario, having been annexed by the Kingdom of Italy earlier that year. Gets event Fascism on the Rise. *These numbers represent the available resources for production at start of the game. In the bracket are the complete numbers including those lost for trading. Manpower totals 15.07K, with 5.57K Free Manpower. The single Albanian division isn't fully equipped and has a recon company. Have a good strategy for Albania?